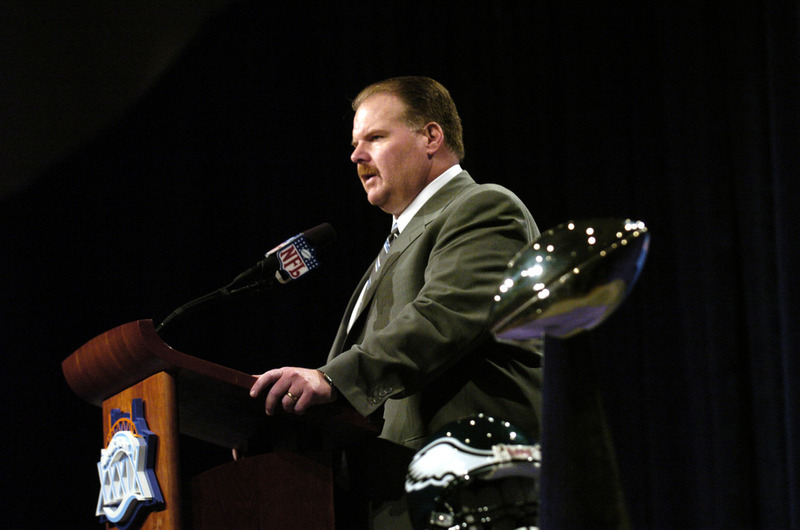 I know we've all moved on to the wonderful potential of the Chip Kelly era, but I wanted to take a moment to look back at the era that was, the 14 years of longstanding success and, ultimately, failure under Andy Reid. Hopefully the graph looks less like a jumble of colors and more like a series of patterns that you can follow. Look, for example, at those first year starters. It spiked in Reid's first season, when he drastically remade the roster. However, it fell off quickly and stayed low -- until the great free agent binge of 2011. Another piece to look at is the top of the graph. Green demarcates the culture-carriers, the players who have been with the team for eight or more seasons. Check out how after Reid took over, he eliminated any players with that distinction, only to have the group slowly reappear and grow from 2003 to 2008. You can see the broader trends easier when you break it down into just three categories. In Reid's first two seasons, he culled the longstanding veterans and added a bunch of new players -- rookies like Donovan McNabb and free agents like Jon Runyan. But during the celebrated run of four NFC Championship games, Reid maximized stability and growth and minimized turnover. You can also see clearly the mini-rebuild he embarked upon following the disastrous 2005 campaign. However, you'll note that while first and second-year starters spiked, the number of starters who'd been in Philly for seven years or more stayed flat. Reid had kept longstanding veterans like McNabb, Runyan, Brian Westbrook, Brian Dawkins, and Tra Thomas while rebooting with youngsters like Todd Herremans, Mike Patterson, Trent Cole, Jamaal Jackson, and Sean Considine. What's fascinating is the third wave, another rebuild that started in 2010 but never really ended. Before the 2010 season, the Eagles had moved on from stalwarts like McNabb, Dawkins, Westbrook, Runyan, and Thomas. The problem is that as they eliminated those players, the replacements never came into their own. Some young players stepped in, like DeSean Jackson and LeSean McCoy. But guys like Nate Allen and Danny Watkins fizzled. Free agents were brought in by the boatload in 2011 to shore that up, but they caused more problems than they solved. In Reid's last two years, half of the starters were basically new to the team -- more than double the amount during the 2001-2004 run. The same pattern emerges. From 2002-2004 the team had 11 or more returning starters, and 15 or more starters who had been with the team for a few years. For example, in 2003 Jermane Mayberry missed most of the year due to injury. Bobbie Williams, in his third year with the team, stepped up to replace him. In 2004 Lito Sheppard and Sheldon Brown took over full time from Bobby Taylor and Troy Vincent. The new pair were relatively inexperienced, but it wasn't their first year on the job either. That makes a big difference. Compare that to 2011. The squad had three rookie starters, three sophomore starters, and four new free agent starters. That kind of discontinuity was a recipe for failure. The lesson Kelly and company need to learn from the Reid era is that you can't build a Super Bowl team in a year. You have a lot of turnover when a new coach arrives, but the front office has to quickly shape the roster and find a core of young players who can grow together. By the time you're ready to compete, 2-3 years later, the team should be stable. And if you're going to rebuild, half-measures and plug-and-play starters won't do. There are no shortcuts to success. Tagged with Philadelphia Eagles, NFL, Andy Reid, Statistics, Graphs, Roster, Chip Kelly, Rookie, Free Agency, Experience. April 5, 2013 by Brian Solomon.